A GreaseMonkey Script to Display SVG TreeMaps of Tags in Connotea. 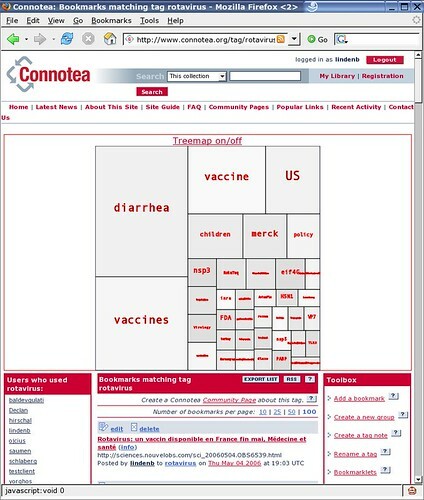 Connotea is a free online reference management service. It allows you to save links to all your favourite articles, references, websites and other online resources with one click. Connotea is also a social bookmarking tool, so you can view other people's collections to discover new, interesting content. The script I wrote is a Greasemonkey user script which alters the content of the web page, when you&apos;browsing connotea: it inserts a treemap of the current tags using SVG. The code was inspired from [here]. As Firefox now supports the SVG format, this drawing can be displayed in your web browser. SVG is a vectorial format: Vector graphics editors allow to rotate, move, mirror, stretch, skew, generally perform affine transformations of objects, change z-order and combine the primitives into more complex objects. .
// select "connoteatreemap", and click Uninstall.